Sen. Ruth Johnson was elected to the Michigan Senate in November 2018 to represent the 14th District. Johnson serves as chair of the Senate Elections Committee and as vice chair of the Senate Local Government Committee. She also is a member of the committees on Environmental Quality; Families, Seniors, and Veterans; Health Policy and Human Services; Judiciary and Public Safety; and Regulatory Reform. Ruth served from 2011 to 2018 as Michigan’s secretary of state, where she made huge strides in streamlining operations, improving customer service and safeguarding elections. 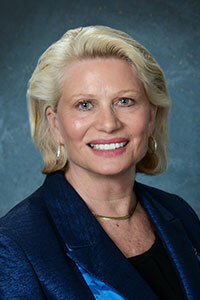 In 2004, Johnson was the first woman ever elected to serve as Oakland County clerk/register of deeds. From 1988 to 2004, she served 10 years on the Oakland County Board of Commissioners and three terms in the Michigan House of Representatives — where she served on the Veterans Affairs, Homeland Security, Education, Health Policy, and Transportation committees. Johnson is a graduate of Waterford Township High School and has an associate’s degree from Oakland Community College, a bachelor’s degree from Oakland University, and a master’s degree from Wayne State University with honors. Ruth is a lifelong resident of northern Oakland County and a former small business owner. She resides in Holly with her daughter Emily.